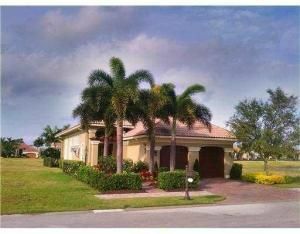 Lovely 2 story 4 bedroom lakefront home is ready for you. Natural gas cooking and water heater help keep energy cost down. Marble floors, granite counter tops, high ceilings along with impact resistant window and doors make this home an excellent place to call home. Each guest suite has its own private bath. Located behind the secure gates of Tesoro, lead to no worries living. Yard and pool is maintained weekly, cable tv and hi-speed internet along with biweekly trash pick up. Call today to view this excellent home.